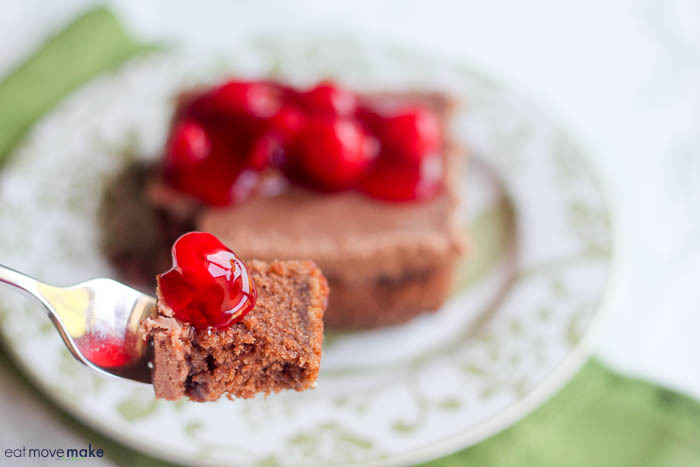 This cherry-topped Cheerwine chocolate cake recipe has been sponsored by Eggland’s Best. Have you ever tried Cheerwine? It’s not actually wine; it’s cherry-flavored soda, and it’s made in my home state of North Carolina (but you can find it elsewhere too). 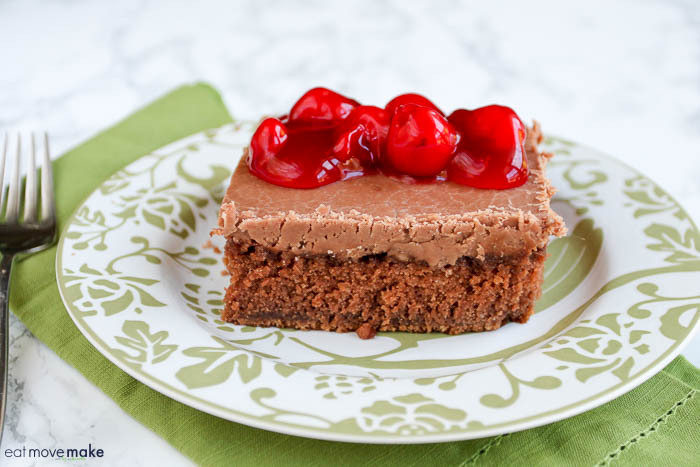 Since I was in the mood to bake something, I started thinking about cherries and chocolate and it popped in my head that adding Cheerwine could turn a chocolate dessert into something even better. The inspiration was kicked off by this year’s theme for the Eggland’s Best “America’s Best Recipe” Contest. It’s all about hometown pride so contestants are invited to submit recipes influenced by some of their favorite state and local ingredients or dishes. Recipes need to include at least two whole Eggland’s Best eggs and fans can enter up to two recipes within each category (8 chances to win) by April 30, 2018 for a chance to win $10,000! Pssst, you guys should enter! 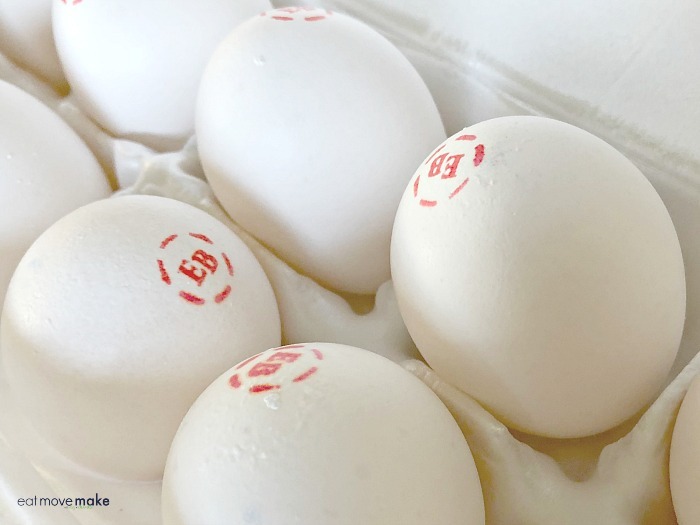 EB eggs have six times more vitamin D, more than double the omega-3s, 10 times more vitamin E and 25% less saturated fat than ordinary eggs. They’re also an excellent source of vitamins D, B12, E, B5 and riboflavin. Independent testing has also confirmed that Eggland’s Best eggs stay fresher longer than ordinary eggs. 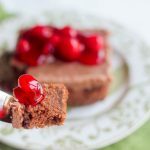 While you’re thinking up your recipe, grab yourself a package of Eggland’s Best eggs and whip up this scrumptious Cheerwine chocolate cake! 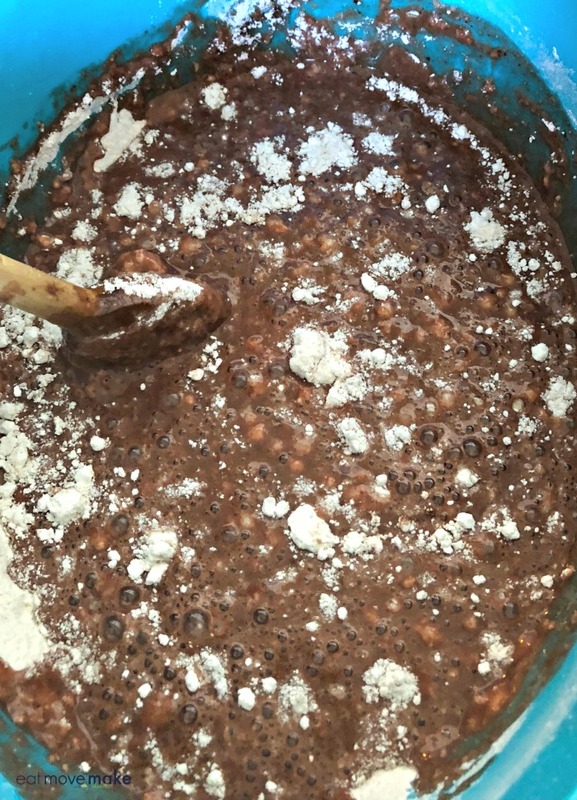 To make the Cheerwine cake batter, heat butter, cocoa and Cheerwine to a boil. Mix it in with the dry ingredients, then mix in the remaining wet ingredients. Pour all that goodness into a baking pan and pop it in the oven. When it’s almost done, you’ll want to make the Cheerwine frosting. And that gets spread over the top of the fresh-from-the-oven hot cake! It’ll take on a shiny, glazed appearance as it heats up from the cake. It looks a little crazed in this photo, but I promise you all is well. Once the frosting has settled into its happy place and the cake has cooled, spoon some cherry pie filling over the individual slices and dig in! Preheat oven to 350 degrees. 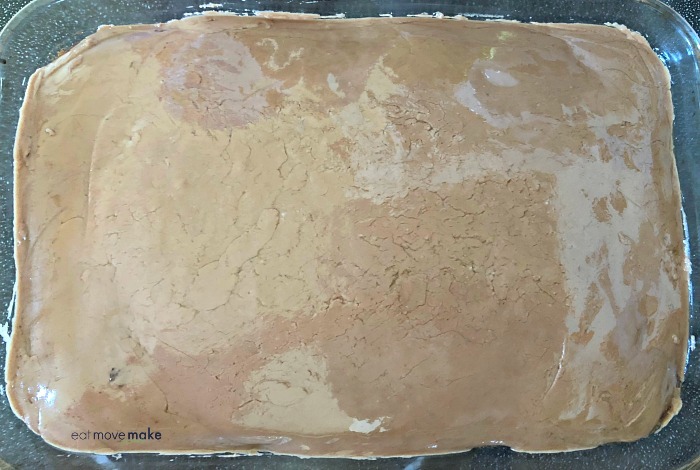 Grease a 9 x 13-inch baking pan. 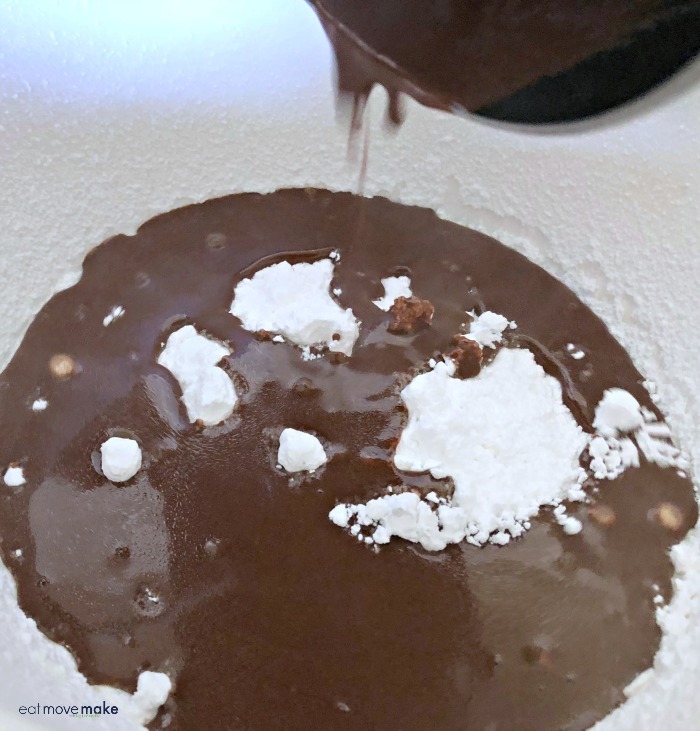 In a large bowl, whisk together flour, sugar, baking soda, cinnamon and salt. Set aside. 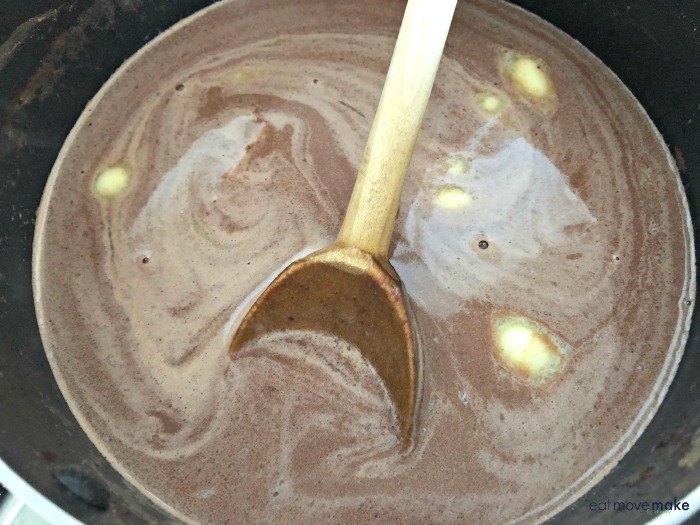 In a small saucepan, combine butter, Cheerwine and unsweetened cocoa. Heat to a boil, stirring occasionally. Stir into flour mixture, blending just until moistened. In a small bowl, whisk together Eggland's Best eggs, buttermilk and vanilla. Add gradually to flour mixture, whisking continuously. Bour into baking pan. Bake 27-30 minutes or until a toothpick inserted in center comes out clean. Serve topped with a spoonful or two of cherry pie filling or a big scoop of vanilla ice cream. 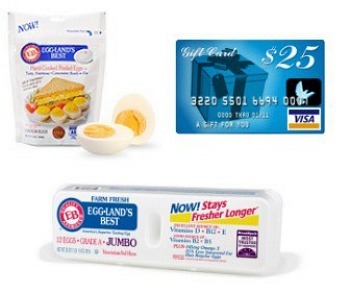 One lucky reader will win a a $25 virtual Visa gift card, one (1) coupon valid for a free dozen Eggland’s Best eggs, and one (1) coupon valid for a free pouch of Eggland’s Best Hard-Cooked Peeled Eggs. 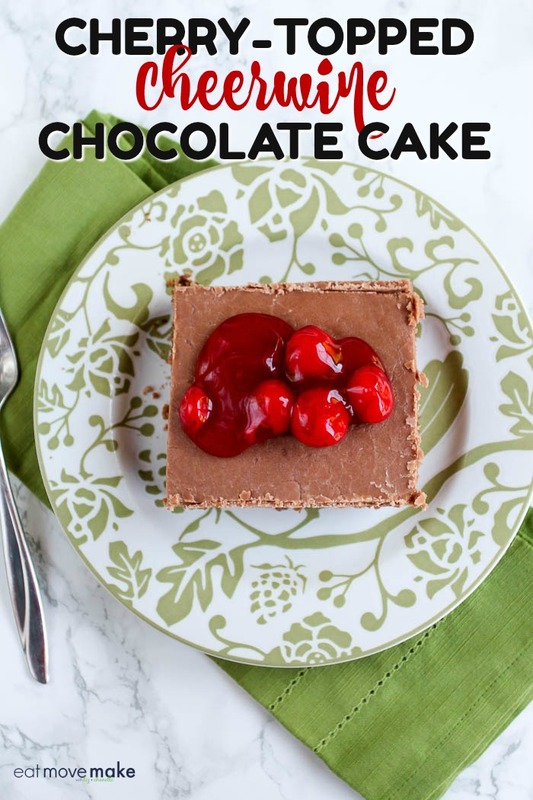 I have never heard of cherry soda used in a cake, but this recipe sure looks delicious! Thanks for linking up with us a the #HomeMattersParty this week! I like my BLT Salad: 110 oz. ala dente mini Farfalle pasta, 4 cups mayonnaise, 2.5 cups sour cream, 6 oz. peas, 9 oz. chopped celery, 11.5 oz. real bacon bits, 22 oz. chopped tomato (roma), 12.5 oz. lettuce. Mix until consistent. My region is the South. We are famous for out pecan pies and sweet tea. I’m in Texas so we have a lot of BBQ and TexMex. Our favorite desert southwest regional ingredient would have to be the Hatch Green Chile; we use it in salsa, pico de gallo, in omelets, etc. I usually buy them fresh, then roast them on the stove above an open flame. Our regional dishes all include some sort of seafood, as I am in Florida. A big favorite is Blue Crab. My favorite midwest dish is Pot Roast, with onion, carrots and potatoes! So good! I love making Indian Tacos and Frybread! Definitely a specialty to my town where I live! A huge regional dish or really spice here is Old Bay. People put it on everything from fudge to french fries. At first I wasn’t a huge fan but apparently after literally trying it on everything, I’ve definitely started to appreciate it in moderation. It’s certainly unique which is cool! Georgia is known as the Peach state. In the summer we have delicious peaches that are mainstays in many recipes. We have Peach pies and Peach Ice Cream to name two. We live in North Georgia. We are best known for Peaches, but we also have a big industry in Pecans. My regional dish is from New Prague, MN and is the Czech traditional kolaches made in a local bakery. A great southern thing I love to bake is buttermilk cornbread. All you need is cornmeal, eggs, buttermilk, a pinch salt and some baking powder! we like everything but datil peppers are something around here. I make my own hot sauce and grow my own peppers. A regional dish in Indiana is a pork tenderloin sandwich. We use a lot of green chile in everything. Gotta love being in E.AZ. Close to NM so hatch chile is cheap!! black eyes peas, chow-chow, and cornbread! Yum yum! In Michigan a couple regional foods would be Coney Dogs(Detroit area) and Fudge(Mackinac Island). I make the best fried tators you will ever eat. I have a couple secret ingredients I use one of which is fajita seasoning which is so good. Apple cider donuts are a regional favorite! Thanks so much for the chances to win. We have a family member that raises chicken for the egg and we always have fresh eggs available. Not really a dish but in NYC bacon egg and cheese sandwich is basically a breakfast staple. The first thing that comes to mind is Key Lime Pie in Key West, FL. I live in the Charlotte area… Krispy Kreme doughnuts was founded in NC, along with Cheerwine and Pepsi. We also have some great barbecue and beer! The cafe featured in the movie fried green tomatoes is located near me. Needless to say, their specialty is fried green tomatoes. When I moved to Oklahoma I learned about okra. Despite my family’s best efforts, I have never become a fan, but all of them seem to love the stuff! I am new to South Carolina so I don’t know any here. But, I lived in New York for 40 years and we loved goulash and lasagna. Oh now wait, NY has the absolute best pizza! I have not had a good pizza since I’ve been here. In Pennsylvania, we are all about Dutch egg noodles and i use these to make a slow cooker chicken noodle soup that my daughter raves about! I live in the south and one of our regional dishes is Jambalaya. Where I’m from my favorite regional dish is bbq ribs with a brown sugar sauce. It is amazing. I have lived in South Carolina for about 10 years now and the regional dish I’ve adopted is my mother-in-law’s cornbread dressing. It’s amazing and beats the stuffing I grew up eating for Thanksgiving! Blueberries Corn, and tomato’s are all grown locally here in southern new jersey, seasons are June – thru late September. I live in Delaware. People here are crazy about scrapple. It’s just what the name implies. I am not a fan, but they love it here. We pick lingonberries in the Northern Woods in Wisconsin and use them in breakfast pancakes! BBQ is popular here, but as a vegetarian, I like to make my own pulled “meat” BBQ sandwiches with jackfruit instead of pork. For California, it would have to be tacos, probably street tacos! I’ve never tried cheerwine before so i’d probably try this with cherry rc. As for regional dishes, they put peppers in everything around here. Here in NC, Barbecue is very popular and fried chicken! Pepperoni rolls which were invented here in WV. I also love a hot dog with slaw on it and I know a lot of places thats considered crazy. Cheese steaks..sauce,onions, cheese, no cheese however ya eat them you can’t beat it. I can’t really think of a “regional” dish that’s popular locally… although I traveled to neighboring state over the last weekend and was able to enjoy Fried Green Tomatoes, something that I like, but can’t seem to find close by. A regional ingredient that comes to mind is pecorino romano cheese. i had it daily growing up in new york. it’s made of sheeps milk. i have found it in my area, but it isn’t popular. Finger steaks are something unique to Idaho I think. I first had them at the fair and thought they were fair food, but I have since discovered that they also have them in restaurants! Regional? I would say that salads and tacos are popular here. I live in NJ but I don’t know of any regional dishes but NJ is known for their delicious tomatoes. We have a couple here in Upstate NY – We are famous for salt potatoes, yep, little potatoes boiled in super salty water with butter on top !!! They are a staple at BBQ’s and Fairs !! Ohio is known for no regional dishes that I know of. I guess I would say corn…so let’s go with cornbread. As I make a mean cornbread. I am from NYC and as everyone says we have the best Pizza and bagels! I’m from the San Francisco Bay Area, we have a lot of good french bread companies and the See’s Candies factory is located here, yummy! The biggest regional dish for Delaware would be eggs and scabble and hash browns. we live in the south so pecan pie is a regional dish that we can get fresh pecans for from our yard. Here in Maryland, we love our steamed blue crabs with Old Bay seasoning. i live on cape cod which is known for seafood but i don’t like seafood except for local clam chowder..mmmm. Cheesesteaks = pennsylvania. Although it is a war of where you can get the best! I live 40 minutes from the Jack Daniels Distillery. 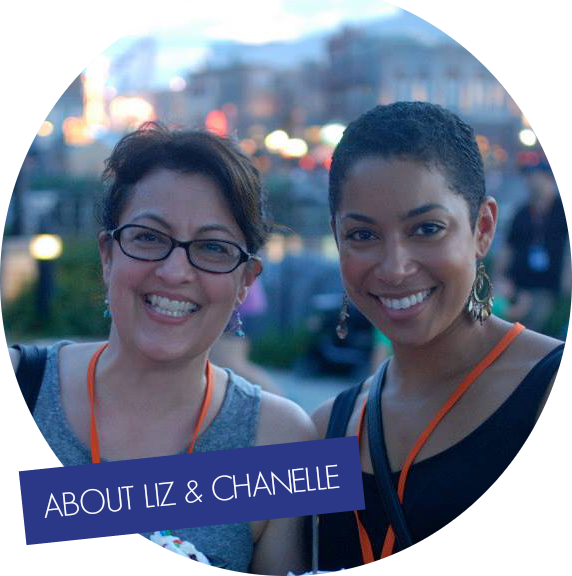 You can imagine the kind of fun boozy treats pop up in the fall. I like the chicken speidies that are regional. Chicken is marinated in a NY state fair winning marinade, grilled and served on a long roll. Delicious, I had never heard of them until we moved to NY though. The maple syrup made here is wonderful too. There are a lot of small operations to purchase it from too. A regional dish would be crab cakes. That looks so good. I live in the South so one of my favorite things is sausage gravy, buttermilk biscuits and cheese eggs. Here in Michigan, we have tons of Apple orchards and I love Apple Butter on different foods. The regional dish I’m most found of is sausage and peppers and onions, grilled on the bbq. There are a lot of cherry orchards here in San Jose, CA — so I guess I would have to say cherries. Here in Omaha, beef is king. My favorite dish is beef stroganoff. I love a good New York Style Cheesecake! So rich and creamy! A couple of regional foods we are known for here in Colorado is Bison and Colorado Lamb. We just had bison burgers last evening with chipotle mayo, pepper jack cheese, and sauteed poblano peppers and mushrooms on them. We have Walla Walla onion stuffed bratwursts that are pretty amazing. I live near San Francisco and we’re known for seafood. My favorite is clam chowder in a bread bowl! If you visit Minnesota you will likely find a Juicy Lucy. It’s a hamburger stuffed with hot melty cheese. That and tator tot hot dish. Peaches make a great cobbler here in GA.
I’m from the Louisville, KY area and bourbon balls are a thing! I never really thought about it, but here in Minnesota we love hot dishes & corn on the cob. With my husband and I both loving to fish and hunt, we have a lot of recipes with fresh fish and a big freezer packed with venison! My daughter actually liked venison over chicken and beef as a baby, and still prefers it. We love to have venison steak and eggs for breakfast! I live near a Mennonite community and love going to their dinners for foods you can’t get in a restaurant like Bohne Beroggi. A dough pocket filled with mashed pinto beans and covered in a sweet cream sauce. I was hesitant to try this at first, but it’s very, very good! Fort Wayne is known for the Coney Island hot dog: A large, natural-casing hot dog topped with a hearty, mildly spiced meat sauce, and with mustard and diced onions. Huevos Rancheros is popular here in Colorado. I enjoy making it for brunch. I live in Washington…APPLE PIE! Yum. We love doing cornbread, greens, and pinto beans! We love cheese here and I make a delicious mac & cheese. In my state we are known for maidrites, which are loose meat sandwiches made of ground beef that is usually cooked with onions and seasonings and served on hamburger buns. We are also known for really good sweet corn. In our area we’re known for our apples which make incredible juice or pie. Pecans are a favorite in everything in Texas, from pecan fried fish to pralines. In the Midwest we like cheese. I have a recipe for a quiche where there is cheese in it specifically one that my family loves that is local. I’m not sure if this is “regional” or not, but in GA (or in the south), restaurants love to serve biscuit bowls which will have a biscuit, bacon, grits, cheese, scrambled eggs all mixed together in one dish. It’s delicious! Well, being that we are from Wisconsin, we love to add cheese to many dishes. Sometimes it seems difficult to find a dish that doesn’t include cheese or dairy products. We are pretty known for our sweet corn so I’ll go with a nice corn chowder! Im in So Ca we have Cotija Cheese enchiladas here that are so luscious and creamy and if you add a green tomatillo sauce its just the right combo. of creamy and a pop of FIRE !!!!!!!!!!! I would have to say that cheese, brats and beer are regional ingredients from my area. Cheese is a regional ingredient that I use in most of my recipes. We like to make homemade apple pie with our local apples. Thank you! Taylor ham, egg and cheese on a roll, New Jersey. In this area of Florida, fresh dishes are very popular. We love avocado toast and fresh fruits from the trees. Thank you for this chance. In my area we are known for cherries, apples, and maple syrup. I would make a fruit bread sweetened with maple syrup. In my area, we are known for cherries, apples and maple syrup. I would create a fruit bread. It would be sweetened with freshly made maple syrup. My area is known for Mexican food; tacos, enchiladas, tostados, chili rellanos, chimichangas, and my favorite green chili burritos! 🙂 Thank you. Living in Tampa, FL, Plant City strawberries are one of my favorites. I like to use them in strawberry shortcake, dipped in chocolate and in salads. I love to make apple pie with from our local apple farms. Not sure how regional it is, but I like a good country fried steak dinner with a baked potato. The eggs give a great crispiness to the steak. I’m from the midwest. We get some excellent and cheap sweetcorn. Perfect just on its own! Here in Hawaii, they eat poi. It’s made from taro root and tastes like I imagine paste would taste. I’m in Florida, and I love using key limes. Nothing like a fresh key lime pie! In Texas we put Jalapeno juice on everything. Soup, bread, you name it. I have never heard of Cheerwine and had to google it! Interesting it sounds good. Here is AZ it is all about the Sonoran Hot Dogs! Inn my area, we love both juicy lucy and hotdish. My region is known for apples and pies and I love to make pies. Our region is known for its fruit apples and pears and they make great pies. I live in Ohio and one of our regional dishes are Buckeye candies. You can’t go wrong with chocolate and peanut butter! I live in Ohio so one of our regional dishes are Buckeye candies. You can’t go wrong with chocolate and peanut butter! Wow, I love eggs so much! We love to make deviled eggs on every occasion. You have a great blog. Thank you so much for the offer! I would think chili and spaghetti since I’m from Ohio. And you can’t forget the mound of cheese on top! I’m living in Memphis at the moment where barbecue is king. However, I’m originally from Louisiana where truly great regional foods reign supreme like seafood gumbo, etouffee, and jambalaya. I really do not know for sure here in P there are a lot of Amish and they have several recipes. I would consider strawberries a regional ingredient for us since they are grown just miles away. I think North Carolina is best known for barbecue. My husband’s company has had several “pig pickings” to celebrate milestones and holidays. My region is known for New England Clam Chowder and if you’ve never had the real home-made thing come and visit for a treat! Bison burgers and Green chili is the regional dishes. I thought it would be rocky mountain oysters, because that’s what everyone told me to try when i moved here. Our Ohio buckeye candies are very popular and delicious. Besides the fried green tomatoes, my region is known for Alabama White BBQ Sauce, Milo’s Tea and Conecuh Sausage. My state is known for marionberries and hazelnuts. I’m not a berry fan, but hazelnuts are great in cookies, scones, or muffins, or as flavoring in coffee. I have no idea what my area is know for, I am in the country and have never heard what we specialize in. I guess it may be apples and anything you can make with apples. Our town is known for it’s onions. All our dishes are heavy on the onions. In my town we are known for our onions. So any dish with onions is very common. Here in Pennsylvania it would be the Philly Cheese Steak Sandwich and sub. This time of year our fresh strawberries are starting to come in. So try to use lots of these on desserts I make now. They are delicious. Top pancakes, Just a dist sliced with some whipped topping, etc. The chicken fried steak was allegedly invented about 40 miles from where I live. Also, CB Stubblefield, the man behind Stubb’s barbecue sauce, opened his first restaurant in my town. I am from the south, so I love to make peach cobbler. Our area charges more at restaurants for steamed fish then for grilled or fried. As a transplant, I am not crazy about the vinegar bbq, I am more of a sweet bbq lover (not crazy for dry rub stuff either). Minnesota is known for wild rice soup! I make mine with heavy cream, chicken stock, mushrooms, wild rice, shredded chicken, garlic, carrots and onion! We are known for apples and huckleberries. I love to use them to make pies. Well, here in Wisconsin, our cheese rivals the best in Europe, so of course a Cheese & Fresh Fruit platter is considered a “MUST” at every fancy buffet. In Texas chili rules. No beans and we like to add jalapenos. In Maryland we use Old Bay seasoning to season many of our recipes. apple trees are plentiful in my area, sweet pototatoes are grown here too. I love apple pie and sweet potato shouffle. I live in the South and make a really good pork fried glazed stuffing casserole. In NJ, Pork Roll sandwiches are big. I live in Florida now and when Key Limes are in season I make a dozen or so Key Lime Pies. Our regional food is apples. I love to make homemade apple pie. I wish I could make good apple dumplings. I am from the north but I love making chicken and dumplings and chicken fried steak…..In fact, I love all southern food. I never thought of frying a pickle, but after experiencing them, they are quite tasty. I’ve had them in Central Kentucky and all along the Ohio at different spots. Regional – I would say Strawberries as we have the strawberry fest going on right now. We make everything from strawberry shakes, pies, chocolate covered, and so much more. Pierogis with butter, hulusky and thick crust pizza are regional foods in my area of PA.